Last entry on-site is 8.30pm. 11 to 15 Year olds full price but must be accompanied by a ticket holding adult (18 years and over). 16 and 17 Year olds pay full price and do not need to be accompanied by a ticket holding adult. It is advisable to have ID with you. 9. 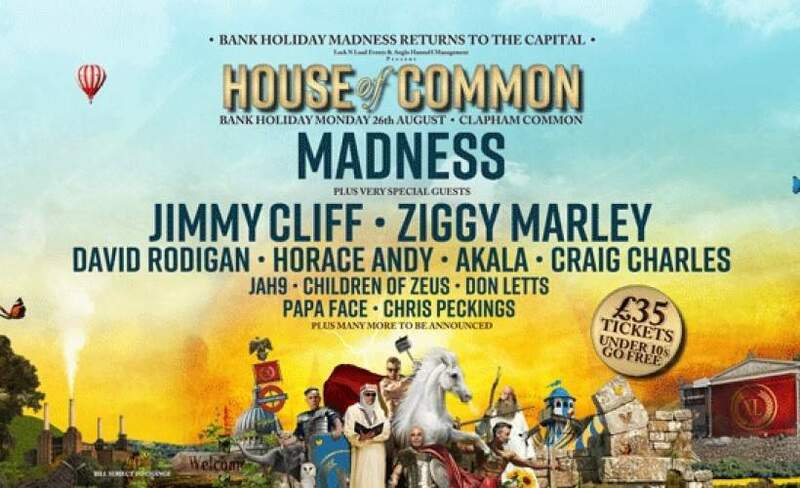 If any Tickets have not been received 7 days before the Event, it is the responsibility of the Ticket Purchaser to contact the relevant customer service centre (details of which are listed at https://www.ticketmaster.co.uk/houseofcommon quoting the booking reference number given to the Ticket Purchaser at the time of the confirmation of sale. 12. Save as set out in paragraph 13 below, Tickets are strictly non-transferable and must not be sold or offered, exposed or made available for sale, or transferred or otherwise disposed of. We reserve the right to cancel without refund any Tickets issued to a Ticket Holder whom we believe plans to offer a Ticket for resale otherwise than in accordance with these Conditions. c. the sale, transfer or disposal must be made strictly subject to these Conditions (and the transferee’s acceptance thereof) which shall be binding upon the transferee in full as if the transferee was the Ticket Purchaser, save only that such transferee shall have no right to transfer the Ticket under this paragraph 13 nor any right to a refund under paragraphs 16 - 23 of these Conditions. d. combined with any other good(s) or service(s) (including as part of any hospitality, accommodation or travel package or service), in each case without our prior written approval. 16. Tickets are sold subject to our right to alter or vary the published Event programme without notification which may result in changes to the performance line-up, playing times or any other aspect of the Event. We reserve all rights in this regard. Any published start times of a performance at the Event are estimates and subject to change. We shall not be liable for any change of a published start time or change to the artists scheduled to perform. No scheduled acts may be considered as headline acts regardless of their relative fame or prominence in the billing and so cancellation by an artist or performer will not entitle you to a refund. 18. As soon as possible after we become aware of postponement, rescheduling or cancellation of the Event, all available information will be posted on https://www.houseofcommon.co.uk but it is the responsibility of the Ticket Holder to ascertain whether the Event has been postponed, rescheduled or cancelled and any new dates, times, and venue. d. the Ticket is used for entry into the Venue. c. if the Ticket Purchaser is otherwise entitled to a refund under applicable law. b. if the Event is rescheduled to a different venue and there are insufficient Tickets available, or the Ticket Holder is unable to attend any rescheduled Event (whether at the Venue or at a different venue), the Ticket Purchaser shall be entitled to apply for a refund pursuant to sub-paragraph 20.b) of these Conditions. 23. Where paragraph 20 of these Conditions applies, only the original Ticket Purchaser may apply for a refund. If we initiate a refund process under sub-paragraphs 20.a), 20.b) or 20.c) of these Conditions, the Ticket Purchaser will be advised of the process and the prescribed deadline for refund applications through the media or via direct communication within 14 working days of the cancellation or rescheduling of the Event. The Ticket Purchaser must follow the prescribed process and deadline and produce the original Ticket in order to be eligible for a refund. We shall not be required to issue a refund in relation to any Ticket which we reasonably believe has been the subject of a sale, transfer or disposal in breach of paragraphs 12 or 14 of these Conditions. 25. These Conditions incorporate the Site Rules. If any Ticket Holder fails to comply with the applicable Site Rules, the Ticket Holder may be refused admission to or evicted from the Venue without refund or compensation. 26. House of Common is an all ages event, subject to restrictions. 27. Admission to the Venue will only be authorised upon presentation of a valid Ticket and (if we and/or any Authorised Representative require) photographic proof of identity and proof of age (driver’s licence or passport). One Ticket will be required for each person, regardless of age. The Ticket Holder is not guaranteed an uninterrupted and/or uninhibited view of any performance, nor is any representation or warranty given as to the quality, content or duration of the Event. 29. For the purposes of safety, security and/or checking compliance with these Conditions, each Ticket Holder shall, if requested by any Authorised Person, co-operate and comply fully with the instructions and guidelines of such Authorised Person (including by producing a valid Ticket and photographic proof of identity and proof of age (driver’s licence or passport)). 30. A Ticket Holder may be requested to submit to a body check and/or a search of his/her possessions and/or vehicle for the purposes of locating and removing any Prohibited Item, and any refusal by the Ticket Holder may result in refusal of admission to or eviction from the Venue without refund or compensation. Sniffer dogs will patrol the queues prior to admission to the Venue and any Prohibited Items will be removed, which may result in the Ticket Holder being refused entry to or evicted from the Venue without refund or compensation. k. whilst within the Venue or the vicinity thereof, fails to comply with instructions from us and/or any Authorised Person, or refuses a security search. production of photographic ID (driver’s licence or passport). It is not possible to collect Wristbands on behalf of other people and all Wristbands must be placed and secured on the individual’s wrist directly by our staff. Your Wristband will be invalidated if any part of it is removed, detached, altered or defaced. Wristbands will not be reissued or replaced regardless of whether you still have your Ticket. 34. The Ticket Holder is responsible for his/her own personal property brought to and into the Venue. Neither we nor, the Official Ticketing Agent, the Owner of the Venue nor any Authorised Person accepts any responsibility for any loss, theft or damage of a Ticket Holder’s personal property. e. hereby unconditionally and irrevocably grants to us a perpetual, exclusive, freely assignable and royalty-free licence to use, adapt, distribute and/or exploit, by any means and in any current and/or future form or type of media or format, any recordings taken by the Ticket Holder within the Venue in breach of paragraph 35 of these Conditions. 37. Warning – Prolonged exposure to loud noise may cause damage to your hearing. Please be aware that strobe lighting, pyrotechnics, lasers, smoke machines and other special effects may be used during the Event. 41. We take the needs of Ticket Holders who are disabled or who have other access requirements very seriously and actively encourage people of all abilities to attend the Event. If you have access requirements for the Event, please purchase your Ticket(s) through Ticketmaster and ensure that you register your requirements with their accessibility team at the point of purchase. 42. Nothing in these Conditions seeks to exclude our liability or that of the owner of the Venue or any Authorised Person for death or personal injury caused by its negligence, fraud or other type of liability which cannot be excluded or limited by law. 43. Subject to paragraph 42 above, neither we nor the Official Ticketing Agent shall have any liability to a Ticket Holder beyond the Face Value of the Ticket Holder’s Ticket. Neither we nor the Official Ticketing Agent shall be responsible to the Ticket Holder for any indirect losses or damages including, but not limited to, loss of enjoyment, goodwill and/or travel or accommodation expenses. Personal arrangements including travel, accommodation or hospitality relating to attendance at the Event which have not been purchased from us are at the Ticket Holder’s own risk. 44. The Ticket Holder acknowledges that their personal information (as provided by the Ticket Purchaser) may be used for the purposes of the implementation of these Conditions subject to applicable law, including for administration, communication, enforcement and access control purposes, in accordance with our Privacy and Cookies Statement (https://www.houseofcommon.co.uk/information/privacy-and-cookie-policy/). We may share relevant information with third parties as may be generally and reasonably necessary for the proper and efficient staging of the Event. 46. We reserve the right to make amendments to these Conditions from time to time at our sole discretion (including, without limitation, by amending or supplementing the Site Rules and/or the list of Prohibited Items). A full copy of the latest version of the Conditions (as amended, if appropriate) will be available at https://www.houseofcommon.co.uk/information/terms-conditions/ and, upon request, from us at the address set out in paragraph 47 of these Conditions. We shall notify Ticket Purchasers of such changes by email if they materially affect Ticket Purchasers’ rights as a consumer. 52. These Conditions will be governed by and interpreted in accordance with English law. Any dispute arising from or in connection with these Conditions or a Ticket Holder’s attendance at the Event will be submitted to the exclusive jurisdiction of the English courts. Notwithstanding the foregoing, we reserve the right to pursue any legal proceedings in a competent court in the defendant's domicile, which proceedings shall be governed by and interpreted in accordance with English law. 53. These Conditions shall not affect a person’s statutory rights as a consumer. For further information about your statutory rights contact Citizens Advice or the Department for Business Innovation and Skills. On the www.festivalsafe.com site, you will find impartial general information which will help you enjoy festivals in general. A large part of this is relevant to HOUSE OF COMMON so please have a look in order to make your experience with us as good as possible. Much of the advice on offer has been verified by experts in each field who are not associated with any one event. The festival has no public car parking available. Please be warned that there is very little parking around Clapham Common on weekends so we strongly advise visitors not to drive. There are plenty of local transport options so leave your car at home and make life easier and the day more fun. Please use nearby Clapham South on the Northern Line (Zone 2) for a short walk across the common. Please note that Clapham Common station will be closed when the event finishes. The best Tube options for getting home will be Clapham South which is around 8 minutes walk or alternatively use Clapham Junction (for Southern or South West Train rail services) which is around a 25 minute walk from the event. Clapham Common tube will be closed from 21.00 on each event evening. With this in mind, we suggest that you use nearby Clapham South (Northern line) or Clapham Junction (Southern services to Victoria or South West Train services to Waterloo). If you are using southbound Northern line services you may wish to use nearby Balham to avoid queues into Clapham South station. FOOD AND DRINK No tables, non folding chairs, BBQs or other such articles may be brought into the event site. Alcohol is not allowed into the event site. Alcoholic and soft drinks will be available for purchase within the event. Soft drinks in glass or cans will not be allowed into the event site. You may however bring in soft drinks in sealed and unbroken 600ml or under plastic or paper containers. Food for personal consumption is allowed. No glass or metal cutlery will be permitted. Folding camping chairs will be allowed onsite for this event. However, there will be a restricted zone covering a large section of the area in front of the main stage where no chairs or such like can be positioned. This will be marshalled by security. This is to make sure that there is ample space at the front of stage to allow people wishing to stand to fully enjoy the show and ensure there is sufficient space for everyone. We appreciate your understanding and cooperation on this. Each of the main toilet blocks in the festival includes disabled toilets, as will the disabled person’s viewing platform. There will be a fully equipped medic’s tent located on site throughout the event. include one carer. On the TM site, choose the day required and click the “Accessible Ticket” button for further information. The ticket purchaser’s name will then be included on a list of permitted persons on the day. The carer will need to pick up his ticket from the site Box Office and the disabled platform access passes. Access to the platform is on a first come first serve basis and at times will become full particularly during the headliner performance. The access ramp will be in accordance with disability regulations. A wheel chair accessible toilet will be located by the ramp. Chairs are not provided but customers can bring their own to use. Please note that there are no cloakroom or locker facilities at this event. Please only bring with you what you are happy to carry. Debit and credit cards are accepted at all the public bars onsite. everyone who is coming to HOUSE OF COMMON this year remains safe and has a great time. Should the weather forecast be wet and umbrellas are needed, please note that we only allow in small sized brollies. Large umbrellas such as golf brollies or anything longer than 12” will not pass security. It is at the discretion of gate security to decide on whether an umbrella is permitted into the event or not. So the best way forward is to bring a small compact, retractable umbrella with you to HOUSE OF COMMON.  Avoid displaying your phone and valuables unnecessarily.  Don’t keep cash, cards and valuables in one place. Spread them out among your pockets and clothing, using pockets secured by zips/buttons or in pockets inside jackets where possible. Be aware that in a crowded environment where contact with other people is unavoidable thieves will try to unzip/unbutton pockets and bags.  Be aware of the behaviour of those around you. Report anything suspicious to a Security Guard or Police officer.  Stick with your friends and identify a suitable meeting point, so if you do get split up you can find each other even if someone has lost their phone or had it stolen.  As soon as you realise that any of your property is missing inform both the venue’s Security and Police immediately. Do not wait until you get home. HOUSE OF COMMON has a clearly marked lost property area located next to the main entrance.  If your mobile phone gets stolen contact your network provider to ask for the SIM card and handset to be blocked.  Activate your phone’s security so that access can only be by applying the correct security measure, be it fingerprint or code or whatever you’ve set up that only you know.  Back up all your contacts and data before you leave home. There is a zero tolerance to drugs policy at HOUSE OF COMMON. Offenders will be handed over to the Police and drug dealers will be prosecuted. Those caught in possession of personal drugs will be evicted from site whatever the circumstances. This includes nitrous oxide/laughing gas and poppers. Do not buy tickets from anywhere other than an affiliated ticket agency or bona fide seller. If you do otherwise you run the risk of having bought either a forgery or a stolen ticket. in but still some got quite upset about it. At the end of the day, the only people that gain from this are the touts. Whatever your excuse, you will not gain access to the event with a forgery. Please also be aware that as tickets are all barcoded, stolen tickets can now be cancelled; and again if your ticket is identified as having been stolen you will not gain access. If you do get refused entry to the event due to your ticket being a forgery or stolen please do not come crying to the organisers. You are an adult and as such should know better than to take this risk by buying a ticket from anyone who cannot prove to you that they genuinely represent this festival. SECURITY AT HOUSE OF COMMON 2019 REQUEST TO ALL TICKET HOLDERS Due to the constant terrorist threat existing in London as well as an increase in pick pocketing Event Security will be thoroughly checking all bags belonging to ticket and pass holders entering the event site. This is, however, a time consuming job therefore ticket holders should aim to arrive at the event site earlier than in normal circumstances as well as cooperate fully with all requests from the Event Security staff. The promoter reserves the right to check any person or thing that it may deem suspicious. Specialized security staff will be profile searching individuals on entry. Please accept the promoter’s apologies should you experience longer than usual queues. Safety checks will be undertaken for the good and safety of all present at the event. Within reason, we aim to collect, log, store and return items of property that are deemed to be genuinely lost by patrons on the HOUSE OF COMMON event site and likely to be sought by the original owner. The Police will collect and retain mobile phones ONLY. They can be contacted at Brixton Police station. Contact number is 020 8649 2025. Please do not contact them for any other matters. You also need to ensure that you have your IMEI number when phoning in order to speed the process up. Enquires can also be made in person at the site entrance (located at Fire Exit E / Gate X8 situated off Long Road) either on Tuesday 27 August from 0900 and 1700. Once we have established an owner, they must pay any applicable postal charges required to reconnect them with their property either by the provision of a stamped self-addressed envelope of suitable size to accommodate the item or by the arranging of a courier to pick the item up. Alternatively we can provide an address for collections in person. evacuation falls under the heading of ‘force majeure’ there would not be any refunds. Adverse weather conditions or an act of terrorism are classified as an act of God. As we all know, the weather in this great country of ours is unpredictable to say the least. Please therefore keep an eye on the weather forecast for the HOUSE OF COMMON weekend and, should it look like rain, bring suitable apparel to keep dry…. if you so wish. There are tented arenas on the site but these can only accommodate part of the audience. So if rain is likely bring your brolly (…of permitted size as mentioned earlier in T&Cs…) and put on your wellies! Nothing stops a good party. WARNINGS Line–up is subject to change. Pick pockets operate at all large attendance events nowadays and specifically target mobile phones. Please be streetwise and keep your personal belongings somewhere safe. Only bring to HOUSE OF COMMON what you really need to have a good time and, in order not to make life easy for pick pockets, keep all your belongings well hidden. Make sure all hand bags are closed at all times. Do not become a victim of crime.